Four days to go, and just under 3K to make the Rick 2.0 Stretch Goal, and 13K to reach the HMS Pegasus Deckplans. My expectations at this point are… entirely useless. I've just no idea at all what's going to happen now. I'm told that the last 48 hours, in particular, can be crazy, and that I should plan on getting little in the way of sleep, and to be prepared for a wild finale. I'm also told that, at this point, there's nothing we can really do, and so we should just sit back and relax and try to catch our breath. I somehow don't see that last one happening. 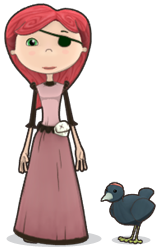 Nelly Cootalot: The Fowl Fleet is a point-and-click adventure game, and the sequel to Nelly Cootalot: Spoonbeaks Ahoy! It's charming, it's all-ages, and it features a red-haired female pirate, so, yeah, win. Their Kickstarter is here, and Eric, Rick, and I all feel it's worth your time to take a look and consider backing their project. You can download their first game for free to get a feel for how they do things, though, unfortunately for us Mac-types, it's Windows only. I mean, c'mon. Look at her. We are now offering both Nicola Scott and Kyle Latino's original Pin-Up pieces, each at their own $300 tier. 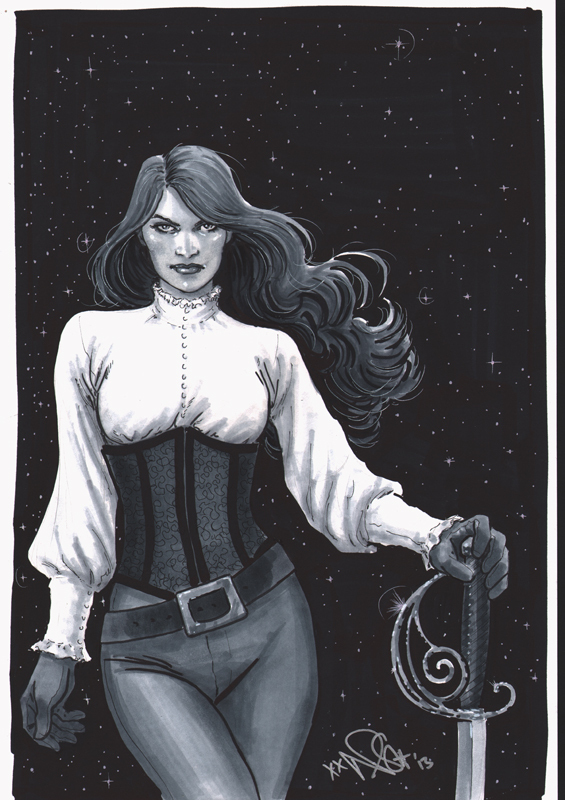 As with the previous pieces of original art, each will come with a copy of the trade in the Style to Which She is Accustomed edition, and all the digital options. Backer Paul Justis is part of a group creating hand-crafted wooden pens and styluses. I actually own a hand-crafted wooden fountain pen (hey, I'm a writer, I put great value in my tools!) and it is, without a doubt, my favorite writing instrument. While I've not had the opportunity to sample one of the ones Paul and his compatriots are producing, if they're anything like the one I own, they feel extraordinary in the hand, with a warmth and heft that puts common disposables to shame. And they're gorgeous. So there's that. Consider giving their campaign a look. They've got a modest goal, and there's no reason they shouldn't be able to meet it. If you'll indulge me for a moment, I've a little self-promotion to share. The first is tangental, but cool enough I wanted to see it get the attention I believe it deserves. 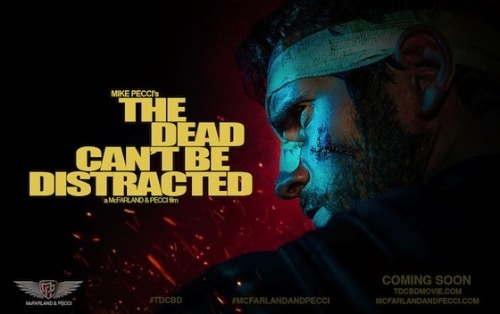 Ian MacFarland and Mike Pecci have made a fan-film inspired by my recently-ended run on The Punisher at Marvel Comics, where I had the privilege of working with the very talented Marco Chechetto. A teaser trailer has been released for the film, and it looks outstanding. To be clear, I've had no part in the making of this film at all, other than writing the books that inspired them. Fair warning - it's the Punisher, so there's blood and implied violence in this trailer. You can find it here. On a far more personal-involvement level, the final order cut-off date for LAZARUS #1 is fast approaching - it's this coming Monday, in fact. LAZARUS is a new, creator-owned series by myself and artist Michael Lark, coming from Image Comics at the end of June. For those of you who may not understand how this works, comic book retailers place their orders roughly a month in advance of the issue's arrival. Pre-orders help them know exactly how many copies they can expect to sell, and thus help them determine their order numbers. 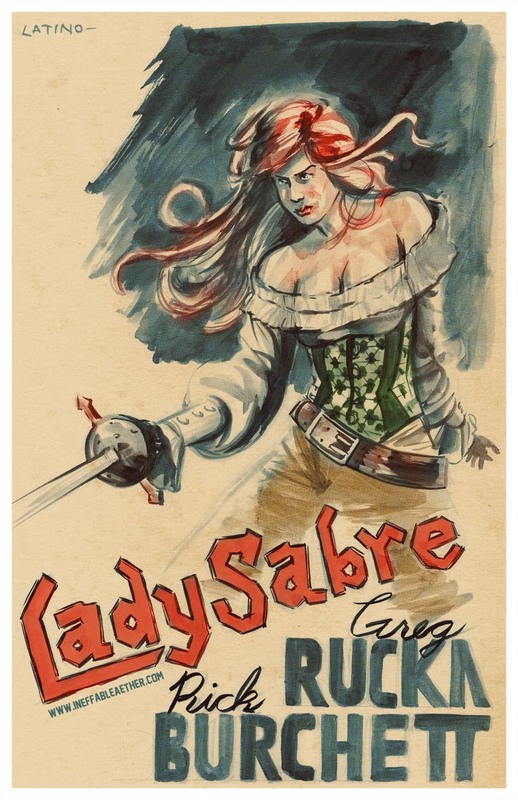 LAZARUS is a very different cat than Lady Sabre, to be sure; it's a mature book, with mature themes and content. It's also a project that I'm passionate about, and one that Michael and I have been pouring blood, sweat, and tears into. If you're curious, here's a link to a PDF short-story Michael and I did to give folks a taste of the world. Ordering information is included. Thank you for your continuing support and passion! Great update. The Pin-Ups are both amazing. Looking forward to Lazarus. Thanks for the shout-out to Nelly Cootalot. Let me just add that everyone should check that project out for the fantastic pitch video alone. Seriously, watch it. Even if you hate games. Speaking of Nicola Scott, are there any plans for the future of Queen & Country? I know you have a lot on your plate right now but I really enjoy that series. Thank you. Thanks to Eric, Rick and Greg for plugging Nelly Cootalot! I only want to add that the game *will* cater to mac/linux via wine-wrappers and (depending on stretch goals...) ports. Thanks again! Looking forward to Vol. 1!